A transparent, performance-focused approach to web design. Really. Websites are the thundering pulse of a business. Web design plays the critical role in the success of most companies’ entire digital operation. Silverback Strategies combines compelling creative, outstanding design and the demand for trackable, tangible business results hardcoded in our company DNA into every website that we build. Plenty of agencies and design shops can craft a website that looks nice. Silverback, however, designs web experiences that are aesthetically pleasing and built for top performance. After all, if a website isn’t delivering leads, prospects and sales, what’s the point? Our in-house design, development, analytics, SEO, and content resources work together to ensure a focused, expert build It’s a transparent process, and the client stays closely looped into the work as we move from stage to stage. We’ll provide extensive QA work, fix any bugs, update every plugin, migrate content from an existing site, set up the necessary SEO redirects, and lock down site security. When it’s time to go live, there are no surprises — just results. 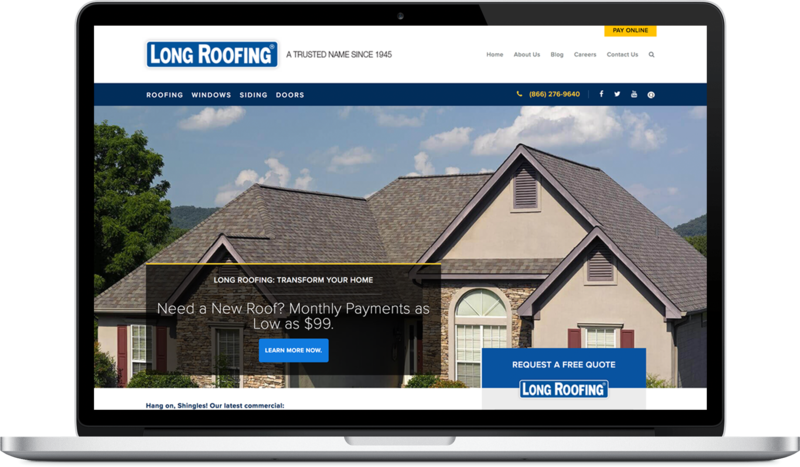 Following Silverback Strategies’ redesign + rebuild of LongRoofing.com, our client saw an immediate 300% increase in mobile leads from form fills and calls while the overall form fill rate skyrocketed by 278%. We’ve seen some major improvements since the start of their involvement...They’re really knowledgeable and are more than willing to explain their process.